One of the many wonderful things about taking a folkart class at Vesterheim Norwegian-American Museum is meeting fellow students. Last summer I met Lynn Sove Maxson, who told me about a wonderful project. 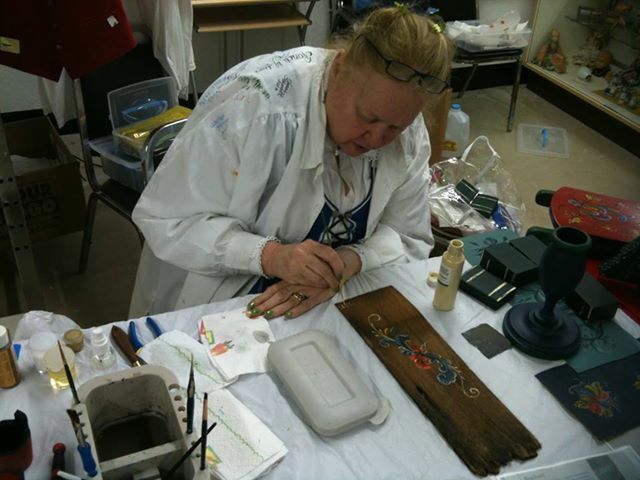 Lynn is an active volunteer at the Norsk Museum in Norway, Illinois. The community, founded in 1834, marks the first permanent Norwegian settlement in North America. Pastor Elling Eielsen preached in a log cabin, which burned in 1841. 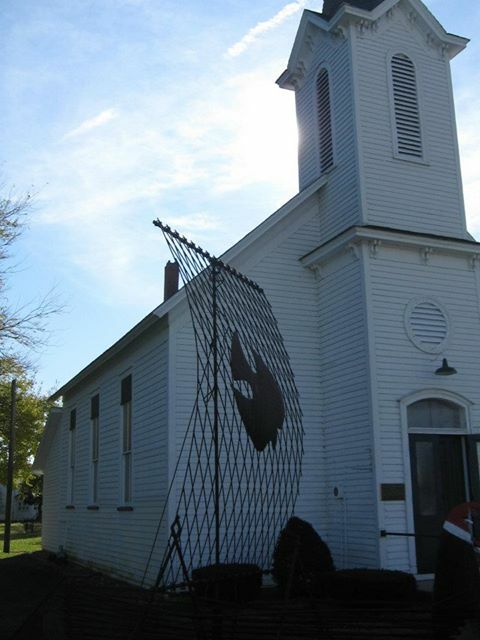 The congregation built a second structure in 1846, which today houses the museum. Many of the original construction features are still visiible. Norsk Museum photo. 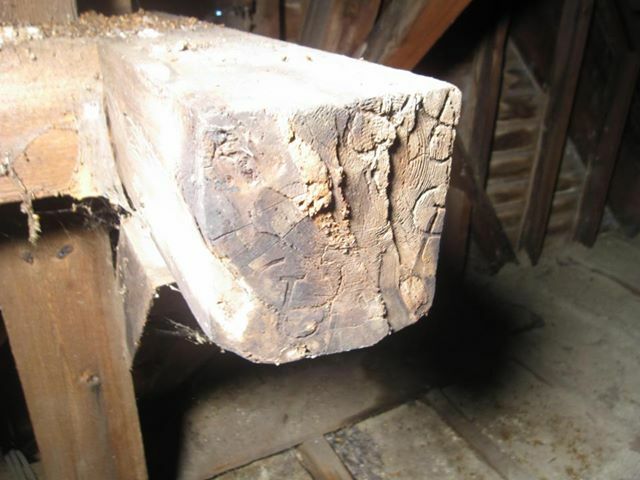 Marks made by the men who raised the building in 1846 are still visible on the old beams. Norsk Museum photo. When a modern roof was needed to protect the building, someone had the foresight to save those shingles hewn in the 1800s, and save them in a garage. Lynn is a talented rosemaler. 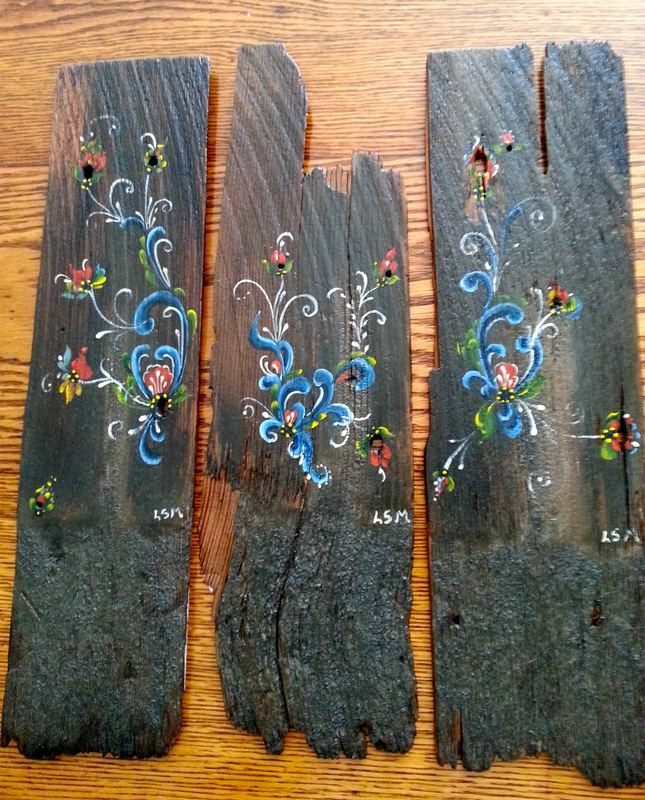 “While demonstrating Telemark rosemaling at the museum,” she wrote later, “I mentioned that it was difficult to find interesting wood to paint. 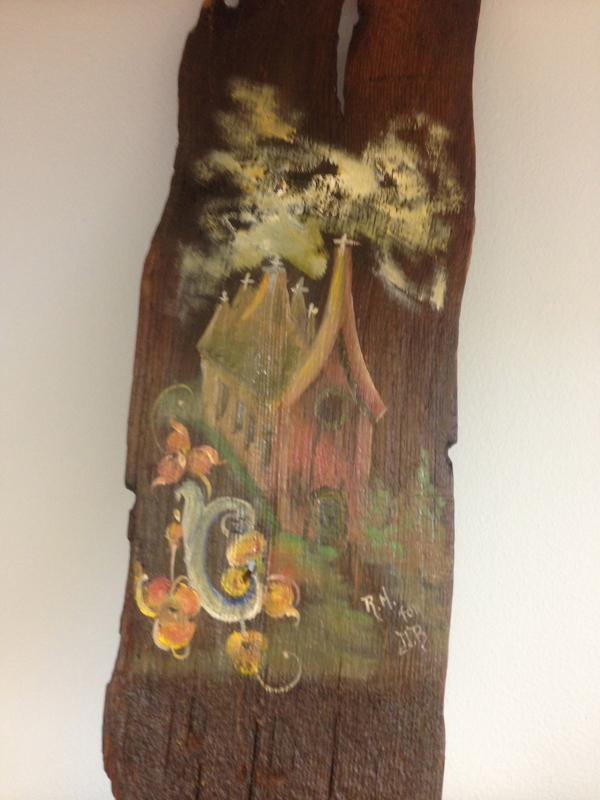 Roald Berg, member of the board of directors, handed me an old dirty cedar shake roof shingle and asked if I could paint it.” She began to paint, and to her surprise, people wanted to buy the shingles on the spot. 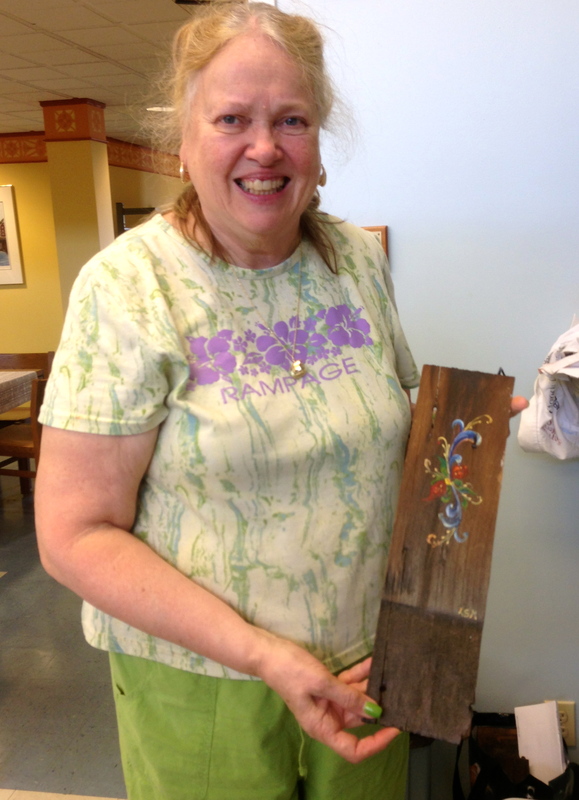 Lynn, demonstrating the Norwegian art of rosemaling. Norsk Museum photo. The Norsk Museum needs a new roof, and Lynn realized she had a great fundraising project. She and other volunteers began cleaning one hundred and sixty-seven years’ worth of dirt from the now-porous, warped, knot-holed shingles. 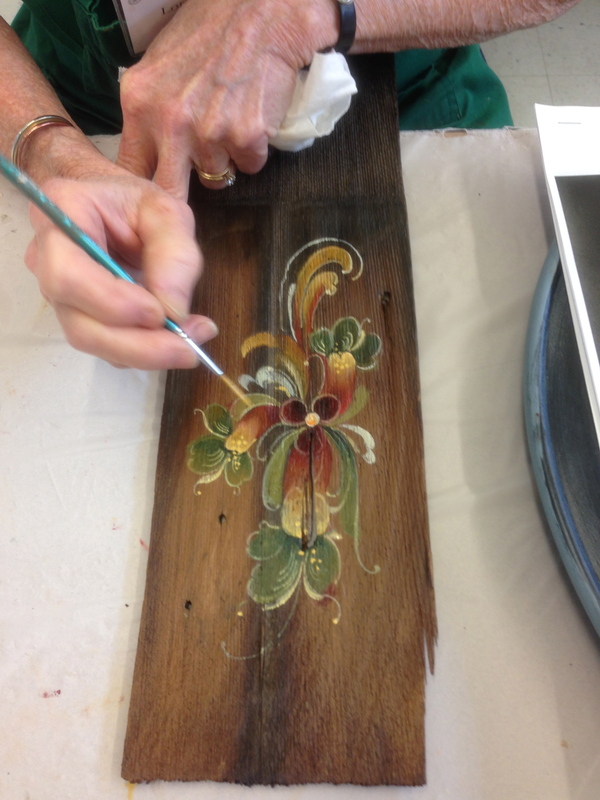 Then Lynn got in touch with some of her rosemaling friends. Would they be willing to paint a shingle or two, which would be sold to benefit the museum? Each painter was free to decide what to paint. Lynn’s only request was that knotholes, cracks, etc. be preserved. Such elements are part of the character of each individual shingle. 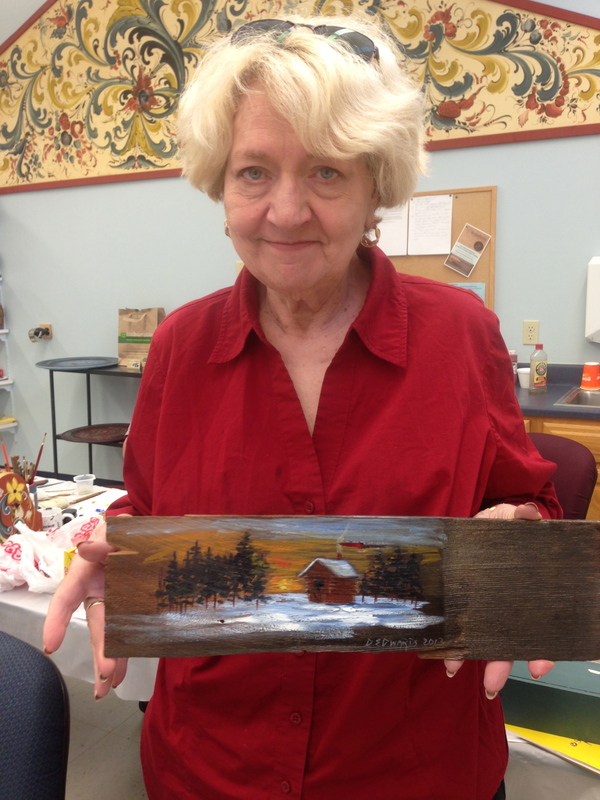 Here’s Lynn with one of her works of art. “The old shingles, which protected the church for so many years and through so much history, will now help the Museum and its Norwegian descendents in a new and original way,” Lynn said. I think the original settlers would be pleased.